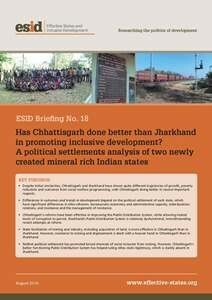 This briefing presents research on the two newly created Indian states of Chhattisgarh and Jharkhand, which have both have pursued mining activities as part of a broader emphasis on modernisation based on mega industries and development. While mining is important for economic growth, it raises questions of dispossession, environmental transformations which unfairly burden the poor, and acts of resistance. Using a political settlements approach, the research asks how these two states compare, not only in terms of facilitating mining, but also in dealing with its social costs, either through direct investments from mining royalties or through other welfare agendas.